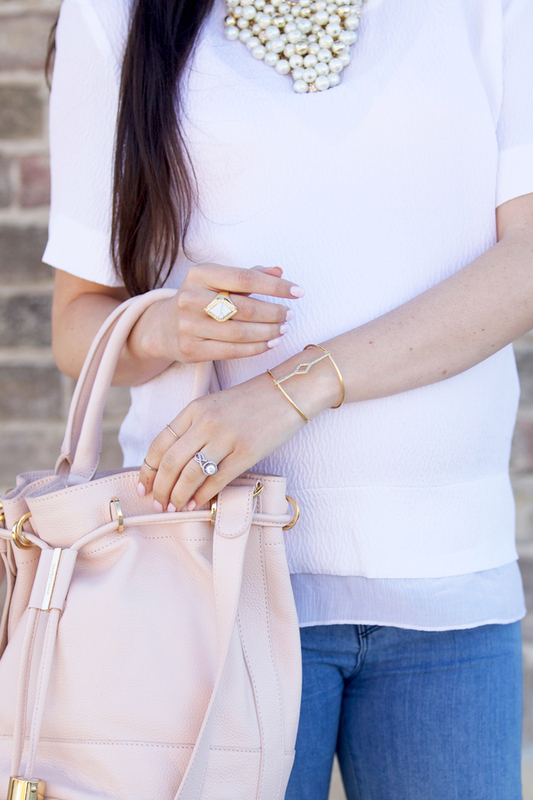 That bag pairs so well with all of your gorgeous jewelry! Beautiful casual chic. Love the heels and the cute bag! I admire your ability to wear heels with your bump! love the simple spring outfit! so chic and effortless! Obsessed with that bag! So perfect for spring! Have a great day, love! Love the color of your top, it’s so pretty! great outfit! love all your accessories! You’re looking oh so pregnant!!! I love the pale pale pink shade of that bag, and the fun tassels! You look lovely and your jewelry collection works so well with your outfit! Pretty! I love the skinny jeans with those heels! Such a simple, but very pretty and girly outfit! OMG in love with that bag but I cant find it in that amazing pink color where did you find it?? I love soft hues, like blush, for spring! I like how you paired it with simple pieces. So stylish! Love this simple and clean look! Beautiful neutral outfit! That bag is gorgeous!! You are such a cute pregger! I have been looking for the perfect bucket bag and I think this may be it! Love that chic bucket bag with the fringe! You really are a pro at wearing pastels. It’s like they were meant for you. Love this top, so flattering to your skin tone. Gorgeous! Love the bag and heels. I’m obsessed with that darling bag, it’s such a pretty shade of pink! Love it!! Such a cute bag!! Loving this look. Very soft and feminine! Love the pretty pastels. Perfect for spring! This bag is perfect for you! That bag is the cutest! Obsessed with your bucket purse! Such a pretty color and perfect for Spring! Love your purchase, beautiful colour! you are just so gorgeous! glad you had fun in hawaii with your fam! Thank you- I found my spring bag! I like your shoes and your Chloe bag. Gorgeous spring look and love your pink heels! You’re such a beauty! Lovely, as always! Looking very lovely for a mom to be. Love the pink heels. I have been looking for the perfect bucket bag and THIS. IS. IT. This is the perfect spring look! You look so amazing!!! love this outfit!! I just love neutrals!! You look so beautiful Rachel! Thank you for sharing! You are killing the soft pinks this season! Pretty!! 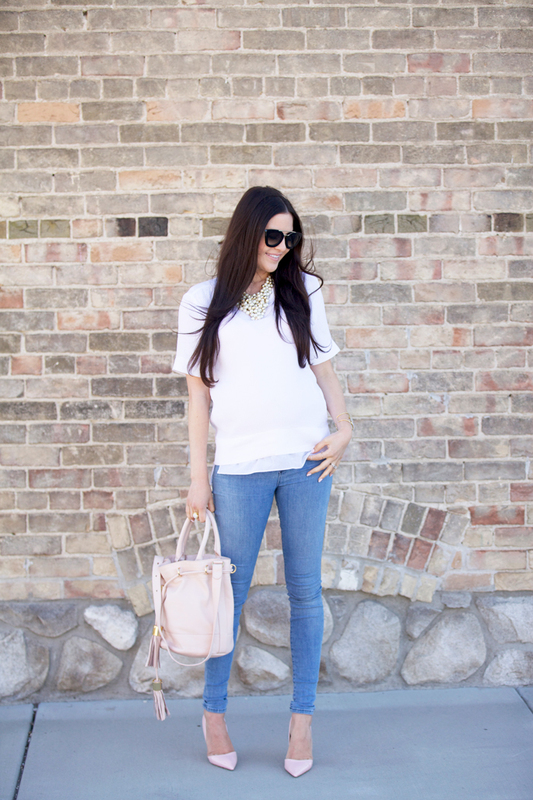 love the light wash denim and the pops of blush! 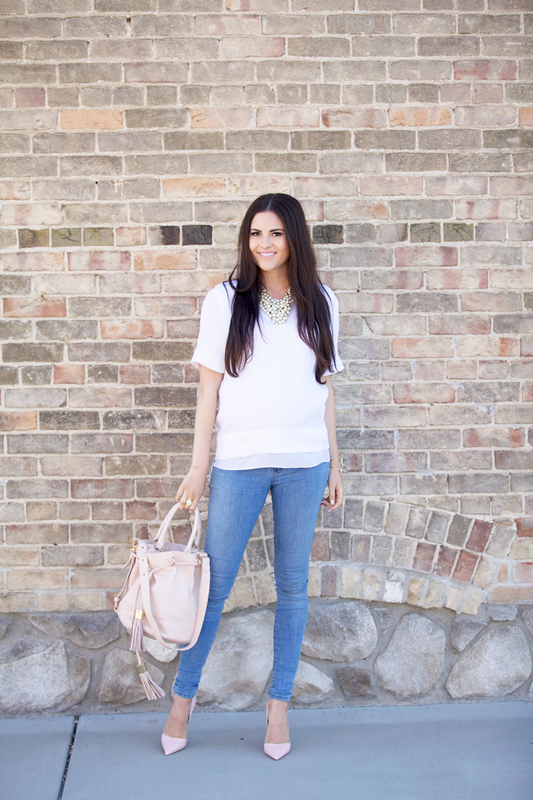 You are looking amazing with these spring time neutrals, and those shoes are gorgeous! Lovely bag and shoes!! Love how your still rocking those heels while pregnant! You look gorgeous! Love the bag and heels! I love the soft pinks for spring time! Great choice! Loving these neutrals paired with your jewelry line! Gorgeous. Beautiful in blush! Love those heels and your new bag! I love your pink handbag! Are those the exact jeans you tagged that you’re wearing in this pic? The jeans in your pic look lighter! Love love love the bag Rachel! Hi, Rachel! I am hoping that you will see this…I ordered those J. Brand jeans, and just got them in the mail today. However, the color seems really off. They are like almost a smoky blue color…not this beautiful light-wash denim that you have! Are these the correct jeans…or a similar style? I actually stole these from sister’s closet :) She told me the style name and looked it up so I think these are the right ones but I’m not 100% I’ll go look on the jeans and see if the tag has any info and let you know! I can only imagine how many questions you receive every day, and I really appreciate you responding. It really means a lot! This is a lovely outfit. I really like the baby pink paired with the blue. So feminine.